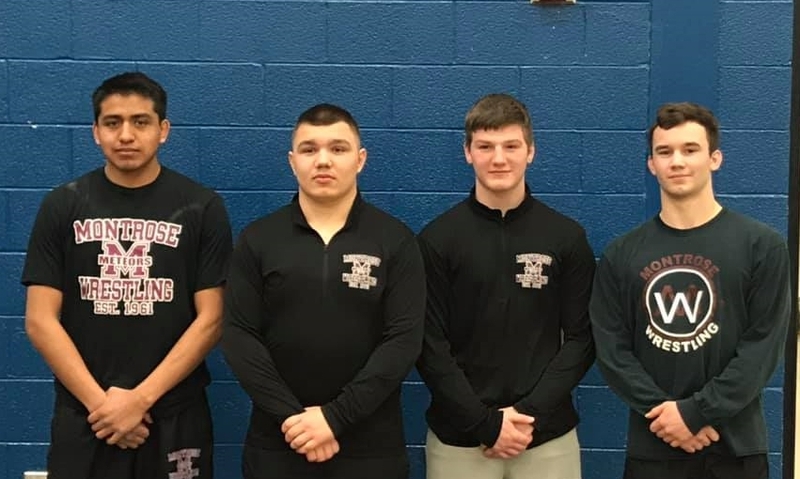 Montrose senior wrestlers participated in the inaugural District All Star Wresting Classic, Saturday, March 16, at Hanover Area High School. The match pitted some of the best Senior wrestlers in Class 2A against wrestlers from Class 3A. Meteor participants from left to right: Marc Avila, Justin Kelly, Bryan Ryan, and Joe Hester. A week after the PIAA championships several local grapplers put on the singlets and hit the mat one more time in the inaugural District II All-Star Wrestling Classic. The event which pitted the District’s best 2A and 3A senior wrestlers against each other featured four wrestlers from Montrose and one from Blue Ridge High School. Montrose’s Joe Hester, who finished eighth at 132 pounds at PIAA championships last weekend, bumped up a class to wrestle Delaware Valley’s Jack Dardia at 138 pounds. Hester let it all out on the mat and earned an 11-6 decision for Team 2A. Teammate Bryan Ryan took to the mat to face Delaware Valley’s Jose Falcon. Ryan fought hard in the back and forth match before falling late 9-6. Montrose Senior Justin Kelly participated in one of the more interesting matches of the day at 285 pounds. Kelly was scheduled to wrestle Nanticoke’s Shane Repasky the District II 3A champion, but when Repasky pulled out late Dallas Area’s Shawn Henninger filled in. Kelly nearly spoiled Henninger’s fill in trip when he nearly took down the much larger Henninger. However, Henninger was able to stay off his back and pinned Kelly at the 1:20 mark to help propel Team 3A to a 38-6 win. At 182 pounds Montrose’s Marc Avila fought valiantly against Dallas’ Steven Newell, who like Hester, was named the Outstanding Class 3A wrestler during the District II championships. Newell eventually pinned Avila in 1:45. Blue Ridge’s Nathan McArthur was selected to compete at 126 pounds versus Scranton’s Bobby Zelinski, however the match was not wrestled. Be the first to comment on "Wrestling all-stars hit the mats"